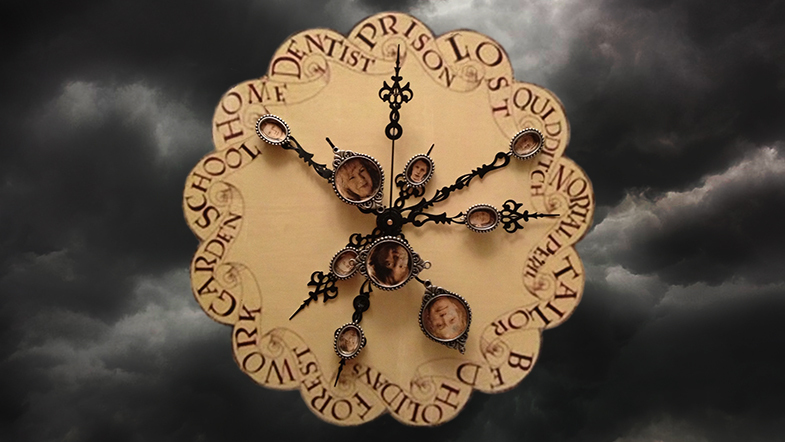 Heads Up, Potter Fans, You Can Now Buy the Weasley’s Clock! DC Creatives, a husband-and-wife team of MIT-trained engineers, have harnessed the magic of the Weasley’s clock and made it a reality. The Eta Clock (pronounced ate-ah) works with a different kind of magic. Kristie and Eric D’Ambrosio-Correll challenged themselves to combine the best of modern and nostalgic engineering, and I’d say they achieved their goal. At just over twenty-four hours live, the Kickstarter has already raised 15% of its goal. Running until October 21st, you can get an Eta Clock for a backing of $350, $150 less than its expected retail price of $500. While the Kickstarter makes no mention of the Weasley’s clock, the Harry Potter inspiration is pretty clear. The twelve icons cover all the bases, with places like “work”, “school”, and “gym” corresponding to user-entered locations while others make educated guesses based on your location: “transit”, “abroad”, or “lost”. With six hands available for your family and friends, this clock is unquestionably useful without being overbearing and stalker-y. I’m totally getting one for my mother. Featured image via Pinterest, Pixabay. The British Invasion: Harry Potter Will Soon Take On NYC!